Perform an Interchange Modification Study (IMS) to reconstruct the interchange at KY 18 (Burlington Pike) to improve congestion. Provide pedestrian facilities across I-71/75 along both sides of the bridge and connecting to existing pedestrian facilities. Construct the improvements as recommended. Improved capacity at the I-71/75 interchange with KY 18 (Burlington Pike) will improve existing and future congestion for employees, residents and visitors of Boone County. 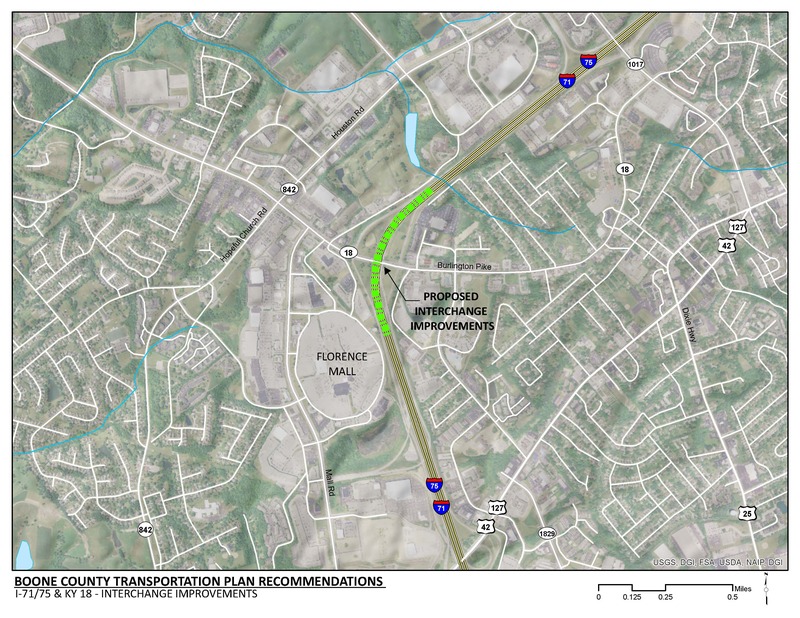 Pedestrian accommodations will be provided along the north and south side of the interchange to connect existing facilities to the east and west of the interchange. These facilities support Boone County’s goal of improving bicycle and pedestrian connectivity and safety throughout the county. Click HERE for a map of multi-use paths in Boone County. Interchange improvements will address existing and future congestion along KY 18. The project will address safety issues relating to the cluster of access points along KY 18 to the east of the interchange including Commerce Drive, Tanners Lane, the TA Travel Center, and the Speedway gas station. There are commercial developments that abut the existing right-of-way for the I-71/75 and KY 18 interchange and may be impacted by proposed improvements. Due to the heavy congestion and businesses in the area, maintenance of traffic during construction will be important to the success of this project. There is existing congestion along KY 18 at the I-71/75 interchange. Forecasted traffic volumes indicate that conditions are expected to continue to degrade to unacceptable levels. There is significant left turning volume from eastbound KY 18 to northbound I-71/75 which largely contributes to congestion on the KY 18 bridge over I-71/75. To the east of the interchange there are several access points that are closely spaced, including Commerce Drive, Tanners Lane, the entrance to the TA Travel Center, and the entrance to the Speedway gas station. The TA Travel Center provides truck parking and is a significant truck traffic generator. The KY 18 (Burlington Pike) interchange serves the City of Florence, substantial commercial development in the Mall Road/KY 842 (Houston Road) area, and several residential areas. The crash rate along KY 18 at the I-71/75 interchange is 25% higher than the average crash rate on similar roadways in Kentucky. Although there are dedicated pedestrian facilities along the south side of KY 18 bridge over I-71/75, there are none along the north side of this wide, six lane facility. The KY 18 interchange with I-71/75 is a critical component of the TANK Fixed Route 32x.